Among all blackjack betting strategies, this one may seem to be strange or even a little bit inconvenient one; but nevertheless it is worth trying at least once. Anyway, you will be able to understand whether it works for you and whether you are ready to use it again. Composition-dependent strategy does not look like card counting and it is based on other principle: if card counting and shuffle tracking depend on a total hand and number of points it gives to a player, a composition-dependent strategy works with each card itself. That is why it works much better for a single-deck blackjack, as it is much easier to control all card combination during a game. Composition-dependent strategy has its own rules for every card combination at blackjack: for example, if a basic strategy tells you to stand if you have a hand of 10 and 2, a composition-dependent strategy will advise you to hit here. But if your 12 points are got by other card combinations (8+4 or 9+3 for example) you will be advised to stand here. Such actions are suggested on any other combinations of cards. It should be remembered that composition-dependent strategy does not influence a player's edge much: it can give you in about 0,15% advantage but bring you extra money if you play in a long run. 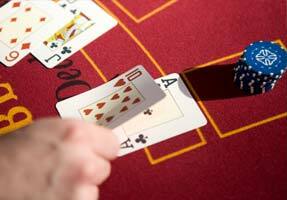 This blackjack strategy is not widely discussed because of a rather small advantage it gives to a player; but it does not mean it should not be tried out be players. Edward Thorp and other fathers of card counting consider blackjack strategies to be the main thing to know for every player, but other competitive blackjack betting strategies should not be forgotten too.